A question at a public lecture at the University of Gloucestershire (bet you didn’t know that Glos. had a Uni. …. well you do now!) last night made me think I should write this up from my PhD. 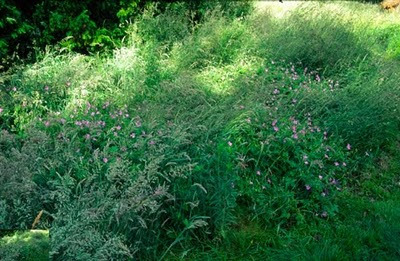 A long time ago (late 1990s) I decided I would run a small-scale experiment on growing perennials in rough grass. I wanted to see if it was possible to create a ‘perennial meadow’, where the grass was cut only once a year. Around the same time James Hitchmough (now at the Uni. of Sheffield) had a similar idea. He, needless to say, was larger-scale and more scientific. Our hope was that we could come up with an alternative to just boring mown grass or long shaggy, but rather untidy grass. Not actually a great success, but not without some hope. 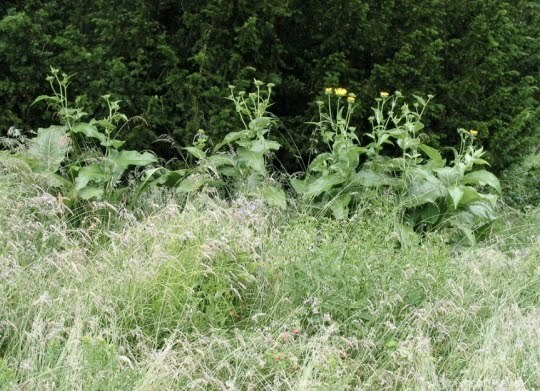 Problem is, nearly all ornamental perennials have a dormant season, during which our native grasses (which makes up both lawns and pasture) and pasture forbs (like dear old creeping buttercup) are growing, give ‘em a mild winter and the things will grow for 365 days a year. So, perennials are immediately out-competed. This is why you get (or one reason why) you get such fab wildflower meadows in places with freezing winters where nothing can grow Oct/Nov to April, like the Alps, eastern Europe etc. – everything here starts off on a level playing field. Our British/NW European long growing season is just too grass/creeping buttercup+other winter-green forb – friendly. • Root competition may also play a part – further research is indicated. Which means geraniums, especially G. endressii, G. versicolor, G. x oxonianum types,(see pic at top) big inulas (e.g. I. racemosa - see pic below), Rudbeckia laciniata and that's about it. Asters did ok for a few years then got slugged. Euphorbia cyparissias did ok with its manic runner production. Meanwhile James found that Lychnis chalcedonica and Papaver orientale did respectably well too.